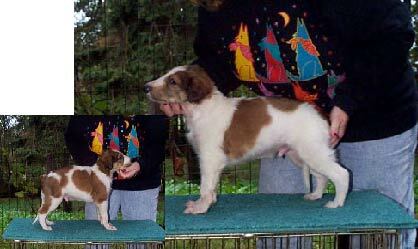 Born August 25, 1999, El Dorado is pictured at 5 weeks of age at Bokhara. and again at 10 weeks of age. 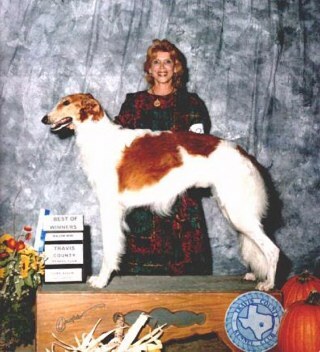 El Dorado is pictured winning both his majors in very limited showing and from the 12-18 class, in one show weekend. He thinks everyone came to the show to see him! 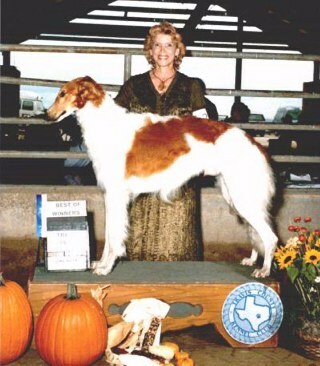 El Dorado started the new year winning his third major (from 12-18) at the Nolan River Kennel Club show, Glen Rose, Texas, January 6, 2001. 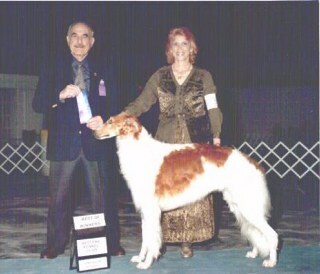 On January 27, 2001, El Dorado won his fourth major at the Abilene Kennel Club show. 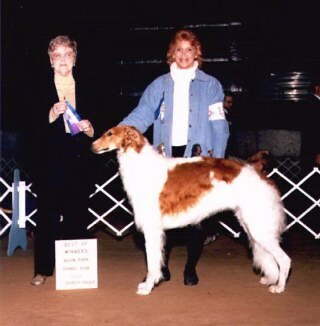 El Dorado finished his American Championship on February 17, 2001, at the Corpus Christi Kennel Club Show, Victoria, Texas at 17 months of age. He finished with four majors and three minors. We went to Monterrey, Mexico to start El Dorado's International career Feb 10-11. He not only won two of the four points required for his Mexican Championship, but won First in the Sighthound Group both days. 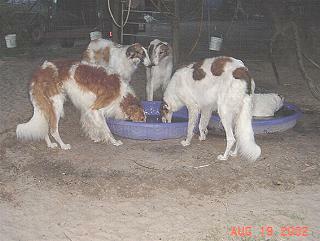 El Dorado is pictured with some of his family - He's left front. Daughter Maggie to is to his right, while son, Rolando, is behind him. To the right of Rolando is Swedish Import Zchatsaj's Shefaro Guillermo. August 19, 2002 at Shefaro. Rolando is a yearling, while Maggie is two. 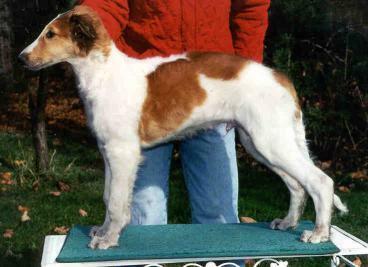 Their dam is Shefaro Marino's Princesa. 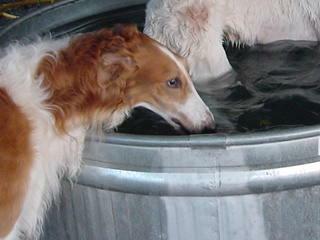 August 21, 2002 - El Dorado's enjoying the new stock tank. 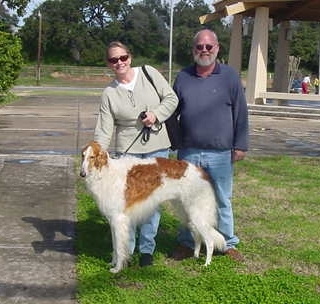 February 9, 2003, El Dorado left for his new home with Robert and Leslie Day. 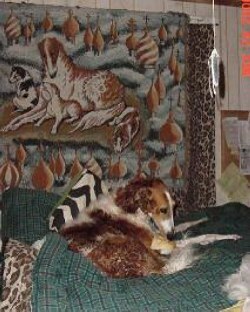 He was a gift to Robert and Leslie who had recently lost their dog of 14 years (Corgi). 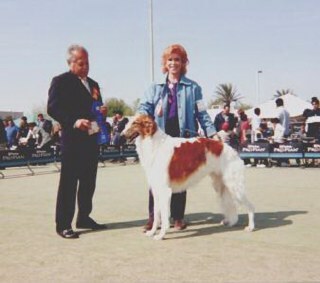 El Dorado was a great show dog with a wonderful temperament, but he has in his gene pool a bite problem which he passed on to his get. His kids/grandkids go undershot at about a year of age. This is not something that shows up until you've put your heart and sole into a dog and then at a year, a show dog turns into a pet. 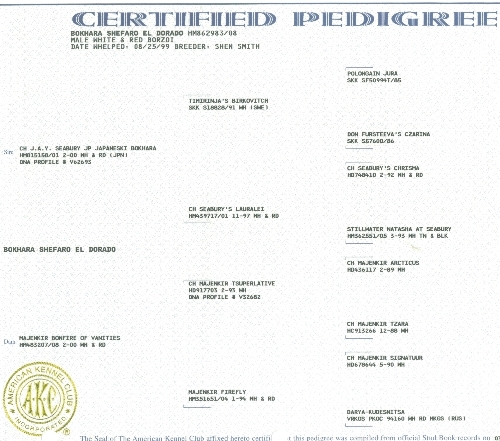 El Dorado is gone from Shefaro's breeding program and most of his get have been sold as pets with no papers. A terrible shame for a dog with great potential as a sire. 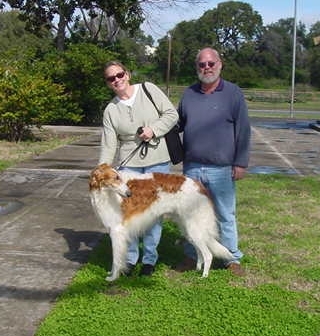 They had met El Dorado's daughter, Notia, and Shefaro's Tuxedo at the home of friends, Mickey and Teresa and they fell in love with the Shefaro Borzoi they met there. I decided to give them El Dorado as a gift because of his negative effect on my breeding program. They are a great pet home which is what El Dorado turned out to be. His bite went off and the gene is strong in his line. He has a great aunt and half-siblings with the same undershot bite. It carried through to his children and grandchildren. Bite doesn't matter to a pet home, but it does to me as a breeder and show person. He is the only dog in the Day family and is being spoiled as a couch potato. Retired from the show ring and as a producer at Shefaro, El Dorado has started his new life as a spoiled companion. The Days absolutely adore El Dorado and vice versa. It was love at first sight. el has settled in nicely with us. he is an absolute dream of a dog. rob and i are both really smitten!!! he and our cat have started to get used to each other. he comes to work with us everyday. he has a nook just for him next to robs desk. he didn't eat for the first few days, which concerned us a little, but he is eating well now. he enjoys being with us and we feel so lucky to have him. thank you so much! we are going to take him over to mickey and teresa's soon to meet their gang. it'll be fun! i will take him to the vet for his shots in march. tell me again what the name of the heartworm prev. he was on.